Welcome to St. Louis English Bulldog Rescue, Inc.
About St. Louis English Bulldog Rescue, Inc.
St. Louis English Bulldog Rescue, Inc. is a 501c3 Not For Profit Corporation that is an all volunteer group of bulldog lovers whose mission is to re-home bulldogs who are surrendered by their owners or find themselves otherwise without homes, landing in animal shelters or wandering the streets as strays. Volunteers provide foster care, veterinary care and rehabilitation for these needy dogs, ultimately finding them forever homes. While St. Louis English Bulldog Rescue rescues and places bulldogs primarily with families in St. Louis and surrounding counties, bulldogs from the surrounding areas are rescued as well..
St. Louis English Bulldog Rescue is a group of caring individuals who began in 2009 taking in, and finding caring homes for bulldogs in need. St. Louis English Bulldog Rescue is not a shelter facility! Foster care for bulldogs in transition is provided in the private homes of St. Louis Bulldog Rescue volunteers, who receive no compensation for their time. Volunteers spend their own money to provide toys, treats, food, grooming and beds for the dogs entrusted to their care. St. Louis English Bulldog Rescue is not a paid network and does not operate under any type of charitable program providing funds for veterinary care. St. Louis English Bulldog Rescue relies solely on donations and fundraisers to finance veterinary exams, inoculations, medications, and surgical procedures including routine spaying/neutering as well as life-enhancing and, sometimes, life-saving surgery. Donations also help pay for food, bedding, grooming supplies, bowls, vitamins and other supplements. 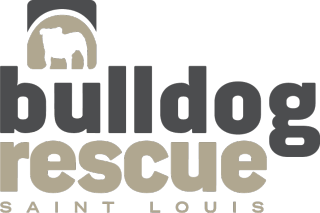 St. Louis English Bulldog Rescue is a tax-exempt 501(c)(3) organization. St. Louis English Bulldog Rescue is operated under the rules of the Bulldog Club of America Rescue Network. For more information on bulldog rescue & adoption in the St. Louis, Missouri area, if you know of a Bulldog in need or would like to volunteer, please CONTACT US. Check out the information HERE on Pet First Aid!